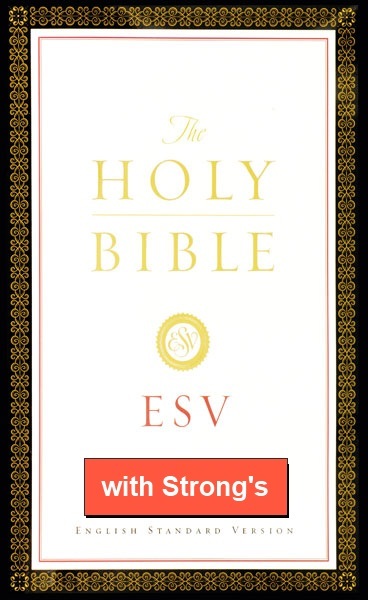 The English Standard Version Bible is now available with Strong's Numbers, a powerful Bible study tool. Like the English Standard Version (ESV) Bible in Olive Tree's Bible App, ESV with Strong's includes all the footnotes and cross-references of the ESV in print, along with poetry formatting, section headings, and red-letter support for the words of Jesus in the Gospels. The ESV is an "essentially literal" translation that seeks to capture the precise wording of the original text and the personal style of each Bible writer. It aims for "word-for-word" correspondence while taking into account differences of grammar, syntax, and idiom between current literary English and the original Greek and Hebrew languages. It seeks to be transparent to the original text, revealing as directly as possible to the reader the structure and meaning of the original. As an essentially literal translation, the ESV works to convey every possible nuance of meaning in the original words of Scripture into contemporary English. It is ideally suited for in-depth study of the Bible.